Recently on Fiverr, I was asked to write a letter, which being a (militant) advocate for written-correspondence I was glad to do. The only problem, though, was that I was asked to talk about “Hope.” Where does one even begin? Deciding not to focus on my own experiences, I wanted to investigate what Hope actually is — and I wanted it to be more practical and philosophical than merely (and often unfulfillingly) poetic. You’ll find here no allusions to spring or sunrise. For such a nebulous but necessary emotion, I think it requires more seriousness than that. For anyone interested in my letters, in September 2013 I posted a series called “Four Men in May,” in which I included one about the last week of my undergraduate career. 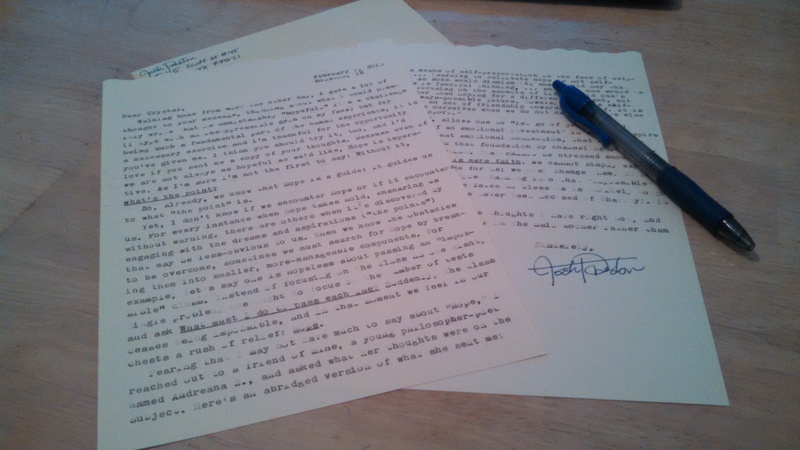 If you’d like me to send you your own letter, visit my Fiverr page here. Walking home from work the other day, I gave a lot of thought to your message, thinking about what I could possibly write that is unmistakably “hopeful.” It’s a challenge (I type with an insuppressible grin on my face) but for being such a fundamental part of the human experience, it is a necessary exercise and I’m thankful for the opportunity you’ve given me. I think you should try it, too, and I’d love if you sent me a copy of your thoughts. Because even if we are not always as hopeful as we’d like, Hope is imperative. As I’m sure I’m not the first to say: Without it, What’s the point? So, already, we know that Hope is a guide: It guides us to what “the point” is. By this I mean it is the quickest way to identify those things that matter most to us. What are you hopeful for? Why? Ask yourself these questions the next time the feeling swells inside of you. Within your answer you’ll discover the aspirations and relationships you cherish most. Yet, I don’t know if we encounter Hope or if it encounters us. For every instance when Hope takes hold, ensnaring us without warning, there are others when it’s discovered by engaging with our aspirations. When we know the obstacles to be overcome, sometimes we must search for Hope by breaking them into smaller, more-manageable components. For example, let’s say one is committed to but hopeless about passing an “impossible” class. Instead of focusing on the class as one giant, single problem, one ought to focus on the number of tests and ask What must I do to pass each one? Suddenly, the class ceases being “impossible,” and in that moment we feel in our chests a rush of relief: Hope. This, she added, allows one to “let go of judgment and permit in oneself an emotional investment” in what we aspire for. “Only with that emotional connection, that hope, can one then build upon that foundation by channeling the hopeful energy” into action. That cannot be stressed enough: Hope without action is mere faith. We cannot expect our problems to change for us; instead, Hope grants us the power to know that there is more in our control than instinct suggests — and for what we can control, we can change. These are all the thoughts I have right now and I’d like to get this letter in the mail sooner rather than later. Reading Rana Dasgupta’s “Tokyo Cancelled” (2005).